There’s the signpost up ahead. Your next stop… confusion. Talk about The Twilight Zone, this episode has just about everything turned upside-down and inside out. 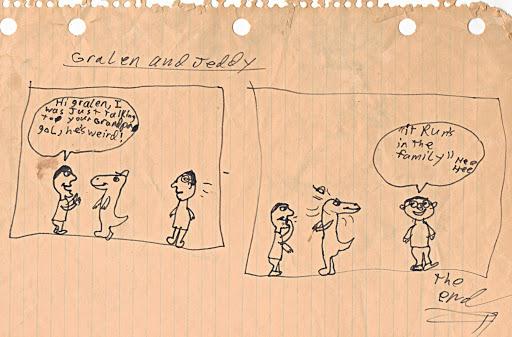 From Gralen being Jeddy’s little brother, to the fact that Jeddy is not a boy like he is in most Gralen And Jeddy cartoons, but in this one he’s a dinosaur. 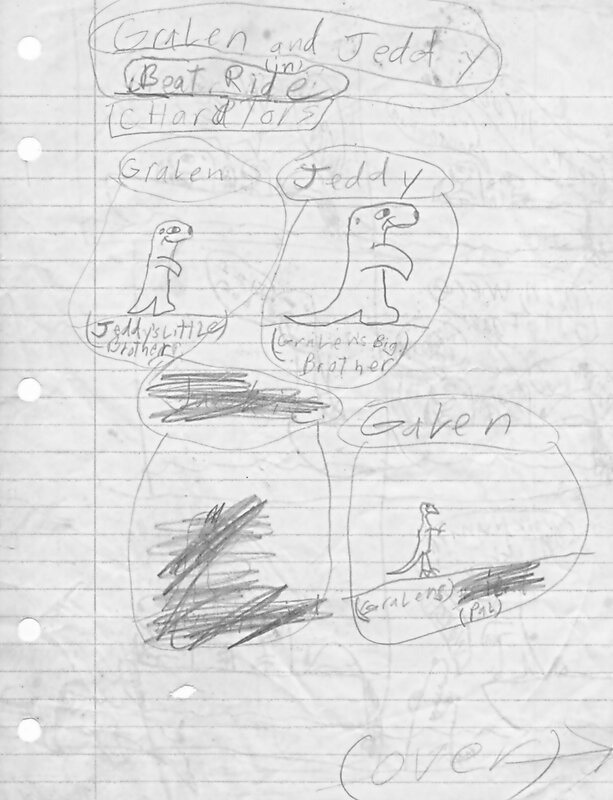 Add to that Gralen’s friend Galen is not a talking ape(I got the name from, of course, The Planet Of The Apes) as he is in other episodes, but he is also a dinosaur. Then there is the issue of the big nostrils drawn on the characters. More like ones you would see on teddy bears. If teddy bears were dinosaurs. And I won’t even go into those arms of Gralen and Jeddy that look like flippers on the title page. 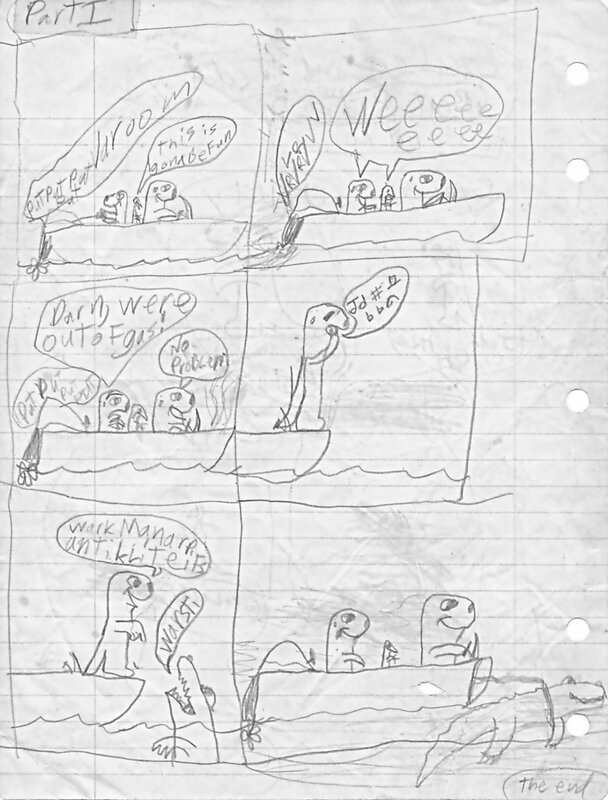 If I didn’t know better, I would think one of my 3 dastardly brothers, or my 1 dastardly sister, infiltrated my little cartoon world and drew their own Gralen And Jeddy cartoon. But still, the writing looks like mine, so unless my dastardly siblings are also dastardly master forgers, it looks like that theory goes right out the window. The cartoon also has my weird sense of humor, or maybe in this case, my no sense of humor. So from whoever made it, here it is. I’ve noticed that Jeddy really didn’t get to voice many of the punch lines in this comic strip. But in this one, he shows that he can be more than a nice, mild-mannered boy with a quick-witted comeback that seems to cut Gralen to the quick. And not only does he manage to insult Gralen AND his grandpa(and his whole family) in one fell swoop, but he does it while listening in on Gralen’s conversation. How’s that for nerve? !